Submitted by samu on July 13, 2009. Absolutely fantastic implementation! I finally have as good a way of accessing my bookmarks as I do of creating them, and it's come out of the blue from the same app! Great work, thank you. Just... perfect. I just want to keep jabbering on about how great it is... but I won't. Thanks! Submitted by Justin on July 13, 2009. Submitted by tony on July 16, 2009. I agree - this is a brilliant update. I'm constantly disappointed by Delicious' own search, so being able to do it locally is perfect. Have you thought about providing a way to do more powerful searches, say, just within one tag? Some handy syntax for that would be useful. Also, it would be nice to have the option to display the Description in the main search results list in some more subtle way (although I realise it's available if you leave a term selected at the moment). Submitted by Justin on July 17, 2009. 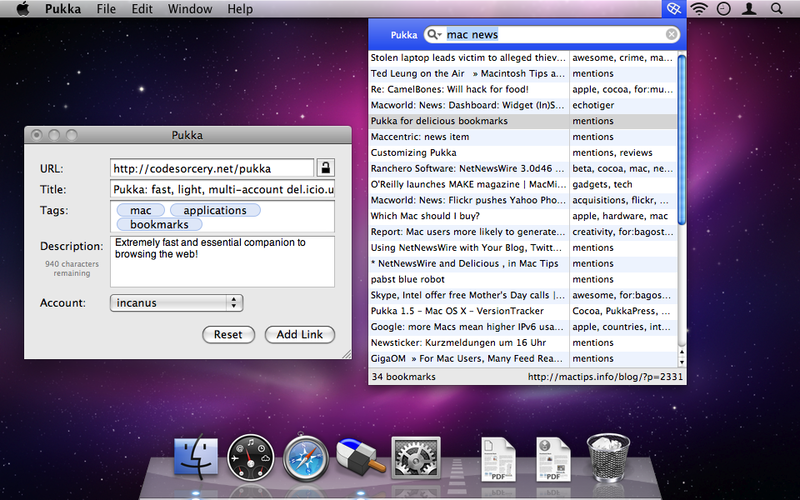 I do indeed plan on adding some more Spotlight-like syntax for power searching, so stay tuned. Re: Thanks for the feedback. Submitted by tony on July 17, 2009. Thanks Justin - reducing the delay for the tool-tip certainly helps. One more minor non-search related feature request I have would be for it to be possible to set private bookmarking as the default, in which case the user would have to un-check the 'lock' button to make a post public. A minor thing, but something which would fit better with my usage of Delicious. Great Justin ! Love the update and love the account prioritization. V Nice.. Search is FAST ! Submitted by Leech on August 27, 2009.
great app but I still can't use it since I use Diigo. I bookmark back my diigo to del.icio.us, but I need pukka for bookmarking more than searching.. both = better, but only search is not very useful for me. Submitted by eddiemorer (not verified) on October 12, 2009. I can't believe it I didn't know about this app already it sounds new in my ears. Now I can switch browsers and still keep other bookmark integration, plus I can save things to my bookmarks account for my friends. Very great! Submitted by jeff888 (not verified) on November 15, 2009.